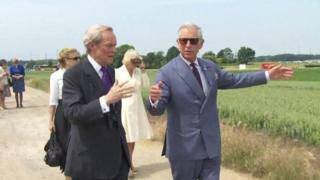 Prince Charles has unveiled a memorial to the British soldiers who fought at the Battle of Waterloo. The prince and the Duchess of Cornwall visited the Belgian battlefield, before unveiling the memorial at Hougoumont farm, a key site in the fighting. Events are marking the 200th anniversary of the battle, which cost thousands of British and allied lives in the defeat of Napoleon's forces. 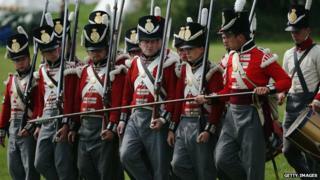 More than 5,000 enthusiasts are due to perform a re-enactment of the battle. Many are camped next to the farm at Hougoumont, a key post held by the Duke of Wellington's allied army, and scene of some of the fiercest fighting of the day. This defence of the farm was so important that Wellington later said the outcome of Waterloo "turned on the closing of the gates at Hougoumont". The new memorial shows two life-size soldiers struggling to close the north gates of the farm, to save it from being overrun by the French. On one of the stone gates are carved words from the Duke's official message to soldiers after the battle: "The army, on any occasion, never conducted itself better." 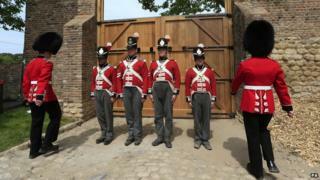 The event is just one of a number being staged to mark the 200th anniversary of Waterloo. The battle was fought after French emperor Napoleon conquered large areas of Europe, before being defeated by allied forces in 1814. On Thursday, there will be a national service at London's St Paul's Cathedral to commemorate the anniversary of the battle. 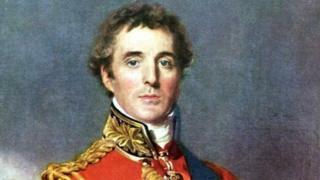 The Battle of Waterloo on 18 June 1815 saw the defeat of Napoleon Bonaparte by the Duke of Wellington. Both men were 46, with big military reputations when they faced off on the battlefield. The battle started at 11am and ended by 8.30pm. The crucial factor was the arrival of Prussian forces from the east, leading to Wellington's historic victory. A defeated Napoleon was exiled to the island of Saint Helena, where he died in 1821. What happened during World War One?